Luton Town’s hopes of getting the green light for a mixed use scheme at Newlands Park this evening is ‘the biggest decision’ in the club’s history according to manager Mick Harford. The development on the area of land next to junction 10 of the M1 is needed to help fund a new 17,500 stadium at Power Court which has already been recommended for approval by Luton Borough Council. A development control committee will meet today to decide whether to give the green light for proposals of a mixture of retail and leisure scheme, that could provide over 4,000 jobs to the community. 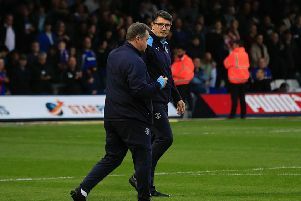 Harford, who is currently in his second spell as manager of the club, said: “It’s massive, this is as big a decision in the football club for donkey's years. “It’s absolutely massive, the club is in good hands in 2020 and Gary (Sweet, chief executive), I’m sure he’ll go along today and set his stall out, and hopefully get everything over the line.